Seventy years ago today, at 11:02 am, the second atomic bomb was dropped on Nagasaki, Japan, a city on Japan's southern island of Kyushu. I feel like I've heard a lot about Hiroshima and its atomic bomb on August 6th for most of my life and less about Nagasaki. 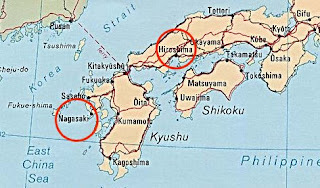 If you look at the map above, just above Nagasaki, there's a city called Sasebo.